Saturn is the only planet visible to the naked eye in the evening skies of July, 2011. Face south-southwest at dusk, and you’ll see Saturn near a star of similar brightness—Spica in Virgo. Saturn is a bit to the right of Spica as you face southwest. The ringed planet remains well placed for evening viewing, and remains in the evening sky until late September 2011. Mars and Jupiter are now higher in the pre-dawn sky. 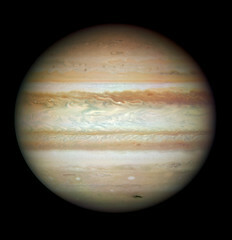 Jupiter, set against a background of very dim stars, dominates the eastern sky at dawn. Mars is dimmer and much lower in the east northeast. It has fully emerged from the sun’s glare, and will brighten slightly each morning. Venus is now out of sight, as it is passing around the far side of the sun from our perspective. The Big Dipper is above the North Star, with its handle pointing up. From that handle, you can ‘arc to Arcturus’ and then ‘speed on to Spica’; those stars are in the southwest at dusk. Leo, the Lion, sets in the west at dusk. Antares, brightest star of Scorpius, the Scorpion, is in the south, with the ‘teapot’ of Sagittarius rising behind it. The Summer Triangle has fully risen in the northeast. The stars of summer now dominate the evening sky. New Moon July 1, 4:02 p.m.
1st Quarter July 8, 9:09 p.m.
Full Moon July 15, 3:12 p.m.
Last Quarter July 23, 6:48 a.m. The new moon of July 1 partially blocks the sun, but only as seen from the Antarctic. No one will get to see a total eclipse because the moon’s full shadow, or umbra, passes just below the Earth. As we celebrate our independence this July 4, Earth will be at aphelion (at its greatest distance from the sun). The precise time is 10 a.m. Perihelion, the Earth’s closest approach to the sun, occurs in January. Earth has perihelion and aphelion because its orbit is not a circle but an ellipse with an eccentricity (out-of-roundness) of about 1.6%. Such a small variation, however, exerts no significant influence on our seasons, as you can determine for yourself by stepping outside. The 23.5 degree tilt of Earth’s axis, on the other hand, is a much more dominant effect. The very high midday sun of July ensures long days and baking heat in Houston and across much of the Northern Hemisphere. By popular demand, our George Observatory will open to the public Fridays and Saturdays this summer (except July 8, due to a prior booking). The Discovery Dome, our traveling planetarium, will be set up each of these Fridays to show films throughout the evening. did you know saturn is the sixth planet from the sun? did you know its -274 degrees Farenheit on Saturn? did you know in roman mythology saturn is the god of agriculture? did you know saturn has 62 moons? 62!!!! and my FAVORITE….did you know one year on Saturn is 29.5 Earth years???? and i think the visibility of saturn from earth is absolutely amazing! its kind of like that scene in total recall when arnold is in the airport and its all red outside and he can see other planets and stuff. Previous Post Houston Press Web Awards: HMNS Best Flickr Pool!